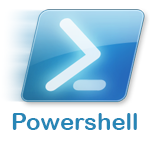 If you are coding in PowerShell, most likely you have been using modules. If you are using the Netapp Ontap PowerShell toolkit, you certainly know the line "Import-Module DataOntap". So you can probably guess that importing a module is just loading someone else's code. A module, when professionally written is most likely "compiled" code. Code written C# or another .NET language and compiled into a DLL. In Visual Studio you can create PowerShell projects. Does that mean, if you want you own module, you need to start learning Visual Studio and C# ? Hell no, you can create your own module in matter of minutes with nothing more that just plain old PowerShell. This isn't going to be a PowerShell course, but I will need to teach you some of PowerShell's best practices if you want to create . One of them is writing a little help for your own powershell cmdlets. The other is add cmdlet-binding. If you are coding in PowerShell, you should at least use a proper PowerShell Editor, there are many out there, powerful ones too and expensive ones. But Windows comes with a default one, called PowerShell ISE. So start that one. The screen can be divided in 3 parts. In the View menu you can enable/disable these. Usually I just use the script & shell. BTW, using CTRL-R you can toggle the script pane. Let's use a simple script for this example. It will write a text in color and underline it. Now we want this to be a module so we can use it everywhere we want. The first thing I always do when I write a module is making sure my function has all the required elements. Notice it has help at the top, it has the "CmdletBinding" and it's showing me how to implement pipeline input. Now this is not a powershell course, so I do assume you know what pipeline input is. Now, also notice that its says your function should have the format Verb-Noun ! This is important. You want to know all the possible verbs ? (like : new-, add-,invoke-, get-, ...), just type "get-verb" in the console. If you run this, notice you will now have a function "Add-Underline". Notice if you type "Get-Help Underline -Full", it will actually show you help information, directly extracted from your code, and check out the pipeline input. Just do something like "date | Underline". This added line of code tells the module which functions should be cmdlets, all other functions (if any) are internal use only, and are not "exported" to the module. Create a folder called "Underline"
Save your script (.psm1) in that directory as "Underline.psm1". (.\Underline is the path of your directory, powershell will assume that there is a subdirectory called Underline with an underline.psm1 in that directory). The first is user-bound, the second is global. As soon as you've copied your module (the directory) to one of these locations, you will now always be able to call it just by typing "import-module Underline". And don't forget : your .psm1 file must be in a directory with the same name (\Underline\Underline.psm1). Now you probably noticed that your module didn't have a "Version number" and maybe you want to add some "Author" information, or your want to add dependencies, like the powershell version, or you want to make sure another module is loaded/installed. Now, again, this isn't a powershell course and I won't tell you everthing about manifests (hell, I don't know everything about manifests), but I can show you the very basics. 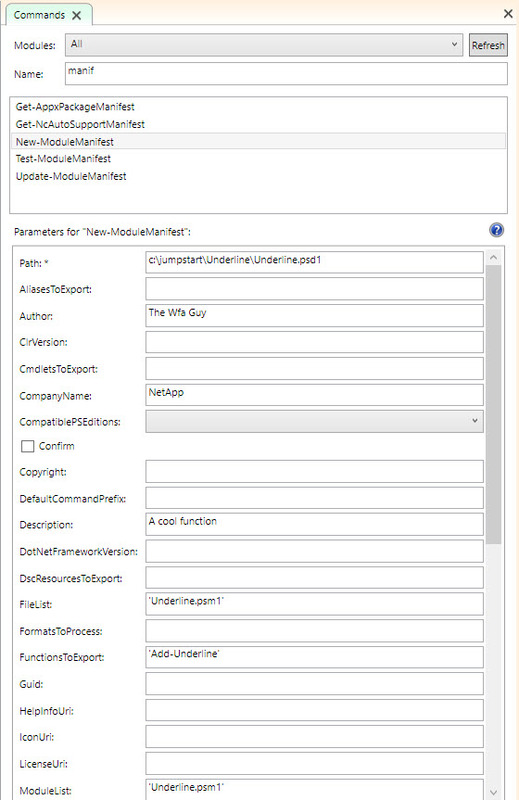 First : remove the line "Export-ModuleMember" again from your .psm1 file. We will add that information in the manifest file instead. Now, to create such a manifest file, there is actually a cmdlet called "New-ModuleManifest", but it has A LOT of parameters. Luckily, the PowerShell ISE application has a CmdLet GUI ! In your PowerShell ISE application, show the Command Add-On (in the view menu). And search for manifest. Select "New-ModuleManifest" and notice a GUI appear for all parameters. Now, here is the difficult part, for the manifest to work properly, you need to fill in the right parameters and in the right format. This is the part were I lost time the first time. In fact, I always open one of my previous working manifest files to have a peep how to do it. FunctionsToExport, ModuleList & FileList : This is a tricky one, you must wrap them in single-quotes and comma separate them as these parameters are of type "string". Once you run the cmdlet, your psd1 file is created. If you open it, you'll see it will have added more things, like copyright, a GUID (this is a unique ID and guarantees that versioning works, in case your module name is not unique). In case your module has extra files, maybe an ini-file or an xml-file or some other dll, then add them in the "filelist" too. Also note that I use "functions to export" not "cmdlets to export" !! That's it. Let me know if this was useful !